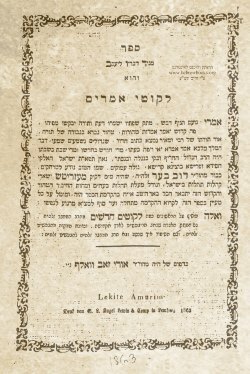 Rabbi Dovber, known as the Maggid, was a disciple of the Baal Shem Tov and the teacher of Rabbi Shneur Zalman of Liadi. He strengthed the Chassidism of his master, anchoring it firmly in Jewish thought and practice. The Maggid felt that he was but a sojourner on earth and his earthly dwelling was not his "home"